What Evidence Do You Have that Neck Manipulation Can Cause a Stroke"
Neck Manipulation Can Cause a Stroke? As a longtime practicing chiropractor who specializes in upper cervical chiropractic adjustments, I have never seen a case of stroke caused by manipulating the neck. What makes you think that such treatment can cause a stroke? Many case reports and the records of hospitals and insurance companies clearly suggest an association of stroke with upper neck manipulation. A simple review of the anatomy of the atlantoaxial joints in the upper cervical spine offers a plausible explanation of how inappropriate manipulation of the upper neck might cause stroke by damaging vertebral and internal carotid arteries. The vertebral arteries in the upper cervical area thread through the transverse processes of the atlas and then make a sharp turn to travel behind the atlas and enter the skull through the foramen magnum (a large opening in the base of the skull). Too much rotation of the skull or the atlas may overstretch the vertebral artery and the vertebrobasilar arteries that supply the back of the brain with blood. Forced rotation forced by manual manipulation should not exceed 45 or 50 degrees in order to avoid kinking vertebral arteries. A head contact should not be used to force rotation of the neck. Sudden stretching of an atherosclerotic or fragile vertebral artery during a rapid manual rotation of the head might cause vertebral artery damage by overcoming the artery's compromised elasticity, causing a tear and bleeding in the inner lining of the artery and releasing clots that may travel to the brain. There is, of course, a vertebral artery on each side of the neck, threading up through the transverse processes of cervical vertebrae from C6 to C1. 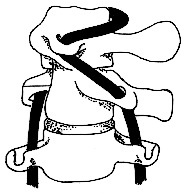 Extreme rotation of the atlantoaxial joint in either direction stretches both arteries to some degree, more on one side or the other, depending upon the direction of rotation. Stretching or compromise of a vertebral artery is usually greater on the side opposite to head rotation. There is also a carotid artery (on each side of the neck) that does not pass through vertebral structures. The internal portion of the carotid artery passes through a small opening (the carotid canal) in the base of the skull to supply the anterior portion of the brain. Injury to the internal carotid artery can occur during vigorous neck manipulation but is less common than traumatic injury to a vertebral artery which passes through vertebral structures. This article was posted on September 12, 2014.